Hello, I finally decided to buy the Madsonic client to remplace my Subsonic app. 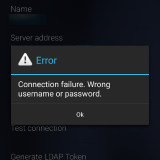 However, while I have no trouble accessing my server from computers (at work or elsewhere) or with the Subsonic app, the Madsonic client cannot connect. Before someone suggests it : NO, I don't use a wrong password. I use the same password manager on my phone than on my computers. I did foward my port from the server to my router, so no trouble there either. It didn't work on the last stable version (6.2 9040), so I tried 6.2 9080 with no success. I tried deleting a re creating the server on the app, no success either. Even after those modifications, I still can easily browse my music from the Subsonic app. Does someone has an idea ? Hey, I still have my problem here to connect from the client. I updated the server to 6.3.9560 but I still have the same problem. Can someone help ? Is there some more information I can gather to find the reason or something ? So I worked around the problem by changing my user password. It is not really a fix since I don't know the reason. I suppose that something in my previous password that was not ok for the app ?